The third edition of the World Snowboard Day, the international snowboarding day initiated by EuroSIMA (European Boardsports Industry Manufacturers Association) and the WSF (World Snowboard Federation) will open the winter season in many snow resorts worldwide Sunday, December 21, 2008. The list of sponsors and supporters is huge, not only limited to snowboard and apparel brands, but to snow enthusiasts in general that want to spread the word and get out in the pow pow to enjoy snowboard at its finest. Authentic “open day”, the World Snowboard Day will enable the masses, from beginners through experts of all ages, to discover and enjoy snowboarding. Skateboarding, Surfing and my other sports have similar days each year set aside to enjoy and relish in their favorite activity of all. 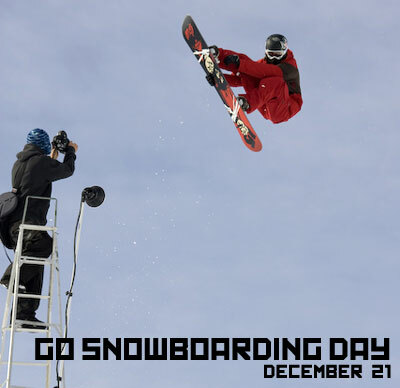 On this day of snowboarding around the world professionals and volunteers of the snowboard scene (federations, resorts, clubs, shops, pro riders, associations, and brands) will mobilize everywhere to share their passion for snowboarding with public. Participating venues will have snowboard lessons, product testing, snowboard demos, contests, environmental awareness, concerts, parties and many other surprises. You can check out the detailed program of activities of the World Snowboard Day in each partner resort on www.world-snowboard-day.com. Posted by Megan	on Tuesday, December 2nd, 2008	in Snow.